Australasian Performing Right Association (APRA) and the Australian Music Centre (AMC) have announced the winners of the inaugural Art Music Awards, the only national event in Australia to acknowledge the enormous achievement and creative successes of Australian performers and composers in the genres of contemporary art music, jazz and experimental music. The gala event held at the Sydney Theatre, Walsh Bay on Tuesday 3rd May 2011 honoured winners across nine national categories and seven State Awards, spanning performance, composition, outstanding contributions to Australian music by individuals and organisations, music education and regional music. An additional Award for Distinguished Services to Australian Music, as determined by the Board of Directors of APRA and the AMC, was also presented. 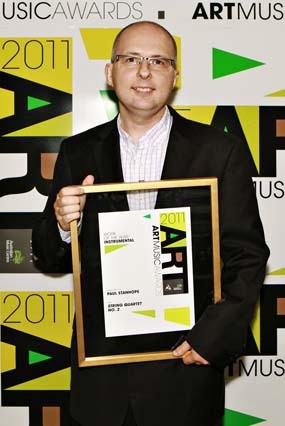 The Awards were hosted by Julian Morrow of ABC TV's The Chaser, and featured live performances from a selection of Award finalists including Paul Stanhope (pictured left), Johannes Luebbers Dectet, Ensemble Offspring, Clocked Out and an installation work by Madeleine Flynn and Tim Humphrey. This year, Sydney-based Paul Stanhope has been honoured with two national Awards: Instrumental Work of the Year, for his beautifully imaginative piece String Quartet No. 2 (performed by Pavel Haas Quartet), and Vocal/Choral Work of the Year, for his exceptionally well-crafted work, Deserts of Exile (taken from Stanhope's Exile Lamentations choral cycle performed by the Choir of Trinity College Cambridge conducted by Stephen Layton). 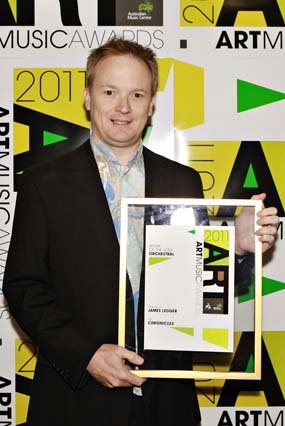 Orchestral Work of the Year was awarded to James Ledger's (pictured left) Chronicles, with finely balanced textures that demonstrate Ledger's mature and original voice. This work was performed by the West Australian Symphony Orchestra (conductor Paul Daniel), where Ledger was composer in residence from 2007 to 2009. 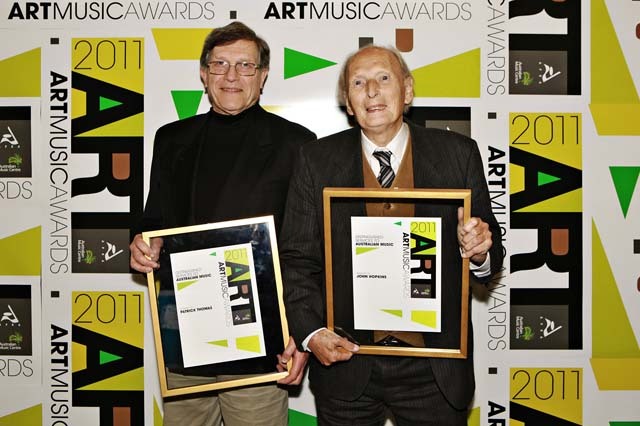 Also a performer at the Art Music Awards, West Australian Johannes Luebbers (pictured left) received the distinction of Jazz Work of the Year for the bold and intelligent big band work Ashes to Ashes, performed by the Johannes Luebbers Dectet. A work musing on the creative connections between art and science took out the Performance of the Year Award. Winning artists, soprano Jane Sheldon and Ensemble Offspring conducted by Roland Peelman, were recognised for their excellent accuracy and tonal polish for their performance of the collaborative project, The Origin Cycle. Winner of the Award for Excellency by and Organisation or Individual was Clocked Out for their annual programs. 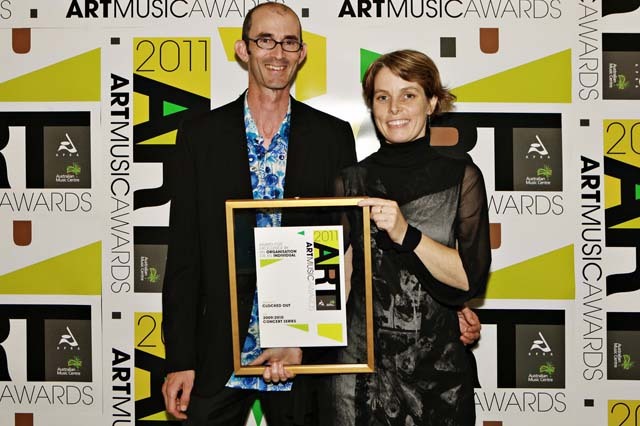 Under Erik Griswold and Vanessa Tomlinson's (pictured left) direction, their 2009-2010 season premiered over 15 new compositions, included three international tours, and involved significant community engagement projects in regional Australia. The Joan Sutherland Performing Arts Centre has been recognised with the Award for Excellence in Music Education, in particular for their music education program based in Western Sydney, 'Composer-in-Focus 2010 with Ross Edwards', where students were given the opportunity to participate in a composition workshop with an established composer and the high-calibre performers of Ensemble Offspring. Finally, the inaugural Award for Excellence in Experimental Music was taken out by Cat Hope (pictured left) for Decibel's 2009/2010 annual program. Under Hope's artistic direction, Decibel, has undertaken 11 commissions for new Australian work, ten performances, toured interstate and performed at leading new music conferences and had four live broadcasts for ABC radio. As already announced, the Award for Distinguished Services to Australian Music was shared between Patrick Thomas OBE and John Hopkins OBE, and both conductors were honoured at the event for their incredible and ongoing contribution to Australian music. In addition to the national Awards above, APRA and AMC committees in each state and territory determined seven State Awards. The State Awards recognise local artists and composers in one of the nine national categories. 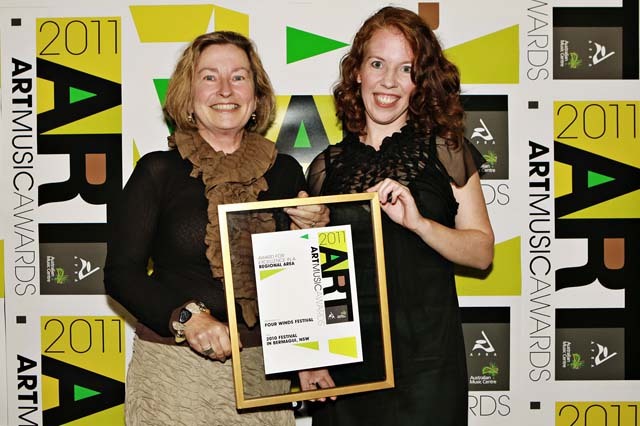 The ACT State Award recognised 'The Voss Journey' produced by the National Film and Sound Archive, Canberra International Music Festival, National Library of Australia in the category of Excellence by an Organisation. 'The Voss Journey' was a collaborative effort inspired by Patrick White's iconic novel Voss, published in 1956, and culminated in four days of seminars, concerts, films and exhibitions investigating the fictional journeys of Johan Ulrich and his historical counterpart Ludwig Leichhardt. In New South Wales, the State Award again honoured Excellence by an Organisation, this time by Moorambilla Voices children's choir. Over the past five years Moorambilla Voices and the associated festival event held in Coonamble, has given hundreds of children from regional and remote New South Wales the opportunity to take part in the festival and participate in music workshops in their local areas. In addition to winning the national Award for Excellence by an Organisation or Individual, Clocked Out were successful in taking out the Queensland State Award for Excellence by an Organisation or Individual, for their 2009-2010 annual programs. Both Tasmania and South Australia honoured composers for Instrumental Works of the Year. 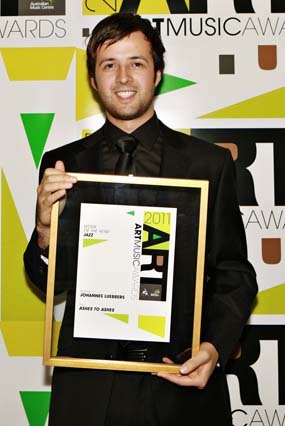 The South Australian State Award went to Grant Sheridan for his piece Airborne, a set of works for strings inspired by poems of redemption, peace and freedom, while in Tasmania, Michael Kieran Harvey received recognition for his homage to the late and legendary composer Frank Zappa, 48 Fugues for Frank. Recorder virtuoso Genevieve Lacey received the Victorian State Award for Performance of the Year for her work En Masse, a piece that incorporates a concert performance, film, and sound installations. Alongside Lacey were collaborators Marc Silver, Lawrence English, John Rodgers, Jim Atkins, Steve Adam, Ben Frost, Nico Muhly, dj olive, Christian Fennesz, Taylor Deupree. 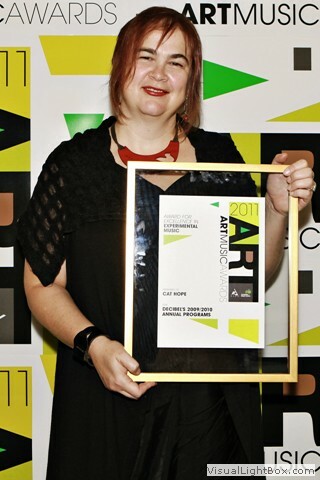 Already a winner of the national Award for Excellence in Experimental Music, artistic director Cat Hope also received the West Australian State Award in the category of Excellence in Experimental Music, again for Decibel's 2009-2010 annual program, which had an incredibly prolific year of creative output. APRA and the AMC congratulate all of this year's winners on their outstanding achievements.